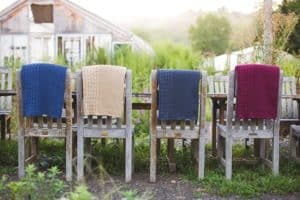 Laurie Perrone, A Hudson Valley-based fashion designer, has her own American-made apparel and home goods line created using high-end yarns and fibers. Laurie sells her product from her website, https://www.farm2fashion.com/ which also explains her fashion industry background and the sustainability vision which fuels her passion for locally sourced and made products. Many of Laurie’s beautiful designs are made from mohair and merino, and derived from goat and lamb raised locally. “Our high end quality yarns are created using Mohair, Merino, Alpaca and Recycled yarns from local farm animals and fields in the U.S. and knit in New York and New Jersey,” she explains on her LinkedIn profile page. 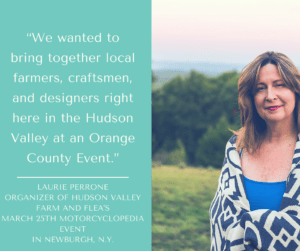 In fact she thinks raising awareness about local makers and artisans is so important she decided to bring an event she calls Hudson Valley Farm and Flea to Newburgh, N.Y. to showcase talented local makers. Doing so supports her company Farm2Fashion’s mission to raise awareness about independent local farmers, craftsmen and designers who conform to the “Made in America” trend fast gaining popularity. This event is open to the public, so mark your calendars! 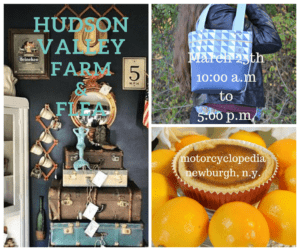 from 10:00 a.m. until 5:00 pm, Motorcyclopedia will be showcase locally prepared food, artisan makers and craftspeople and other creative talents! One vendor is an Orange County Accelerator former start-up maker, Unshattered. They are all grown up and off to their own space now!